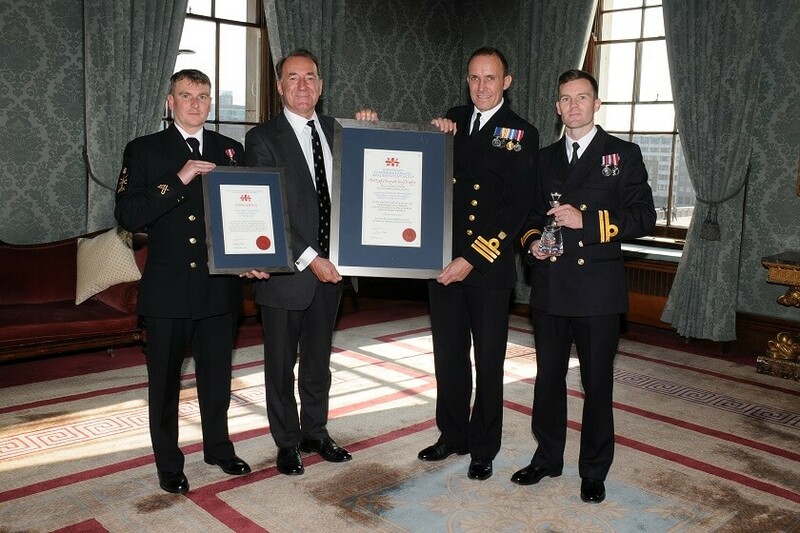 HMS CLYDE, the Royal Navy’s Falkland Islands patrol vessel, under the Command of Commander David Gillett RN responded to a distress call from the 10,000-ton cruise ship Le Boreal on 18 November 2015. The ship reported suffering a major engine room fire, which caused the loss of all power and left her drifting in heavy seas. 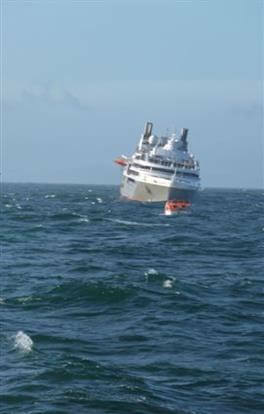 A north-westerly gale placed the ship in real danger of grounding on Cape Dolphin, East Falkland. The captain ordered the ship, with 347 passengers and crew, to be abandoned early on the morning of 18 November 2015. According to one source familiar with the operation, passengers were in lifeboats for up to seven hours. Working closely with the Falkland Islands Government, British Forces enacted a major search and rescue plan. Two RAF Search and Rescue helicopters were scrambled, along with two other support helicopters, together with a C130 Hercules and a Voyager aircraft for command and control. HMS CLYDE was dispatched to the scene. The helicopters successfully winched 79 people from the deck of the Le Boreal and from two life rafts in the water. HMS CLYDE assisted two further lifeboats with over 200 evacuees on board, ensuring they were brought to safety and Le Boreal was brought under tow by two Dutch tugs to the military port at East Cove. In heavy sea and swell HMS CLYDE transited at full speed to the stricken vessel. Arriving on scene at 0700 it was evident that the cruise ship had taken on water, most probably from the firefighting effort and was listing heavily to port. There were four lifeboats in the water, two small ones whose passengers were being winched to safety by Seaking helicopters and two larger ones, each with over 100 passengers on board. The Seakings were unable to winch directly from these lifeboats. 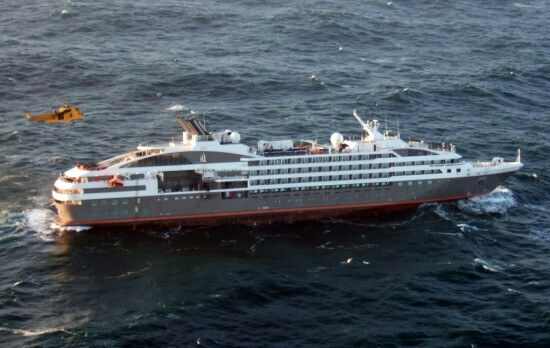 A skeleton crew remained on MV Le Boreal in an attempt to contain the incident. HMS CLYDE’s Captain considered taking on the passengers from the lifeboats by pilot ladder. However, in the confused swell he was unable to generate a good enough lee and this idea was discounted following a dummy approach which revealed the flimsy construction of the lifeboats and the high risk that any damage would quickly cause them to take on water. Two attempts were made to pass a tow but the line became detached on both occasions. HMS CLYDE then launched her Pacific 22 seaboat in gale force winds, with sea state 6 and a confused 3m swell, which would normally be out of limits, and dispatched the Chief Bosun’s Mate, Petty Officer Luke Hallis, to the two lifeboats (capable of 5kts) that were rocking uncomfortably 15 miles from land. One of the lifeboat coxswains was highly distressed. Embarking in one of the lifeboats, Luke Hallis immediately imposed his authority on a chaotic situation, calming those around him and showing firm, clear leadership and seamanship skills in regaining control. He established that the fittings would not support a tow. 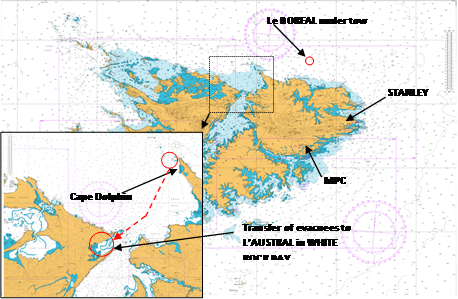 After replenishing one of the lifeboats with fuel and ensuring that the passengers were given food and water, HMS CLYDE escorted the lifeboats for the 15 nautical miles to White Rock Bay, West Falkland – there was no safe landing point at Cape Dolphin. Conditions in the lifeboats were poor with sloshing vomit amongst very tired and distressed passengers. Petty Officer Hallis remained on board the lead lifeboat to coordinated the transit in heavy seas to calmer waters where the passengers were transferred to a sister cruise ship, under the supervision of other members of HMS CLYDE’s ship’s company. HMS CLYDE’s Operations Officer, a native French speaker, provided continuous reassurance to the lifeboats over VHF. No-one was lost and no major injuries were sustained. In total all 347 passengers and crew were rescued.